We have an extensive range of SURFACE MOUNT HANDLES to suit every requirement with large stock levels for speedy despatch. Heavy Duty Drop Handle - Zinc Plated Heavy Duty Drop Handle. .. Heavy Duty Surface Mount Flip Handle. Material: 1.2mm / 18 gauge Steel with 12mm / .. Heavy Duty Surface Mount Flip Handle. Material: 1.2mm / 18 gauge Steel with 19mm / ..
Un-sprung Surface Handle with Rubber Grip Un-sprung Surface Ha.. Heavy Duty Drop Handle. 90° stop. Steel, Black Powder Coated. .. Monthly Special - Last Few Remaining Pack of 10 for only £12.00 (ex-vat) .. 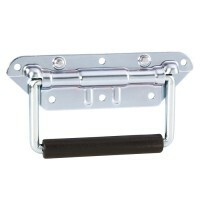 Sprung Surface Handle, with Rubber Grip Material - Steel Fixing holes: 5.1mm .. Sprung Surface Handle, with 19mm / 3/4" Grip Material: 1.5mm / 16 gauge Steel ..